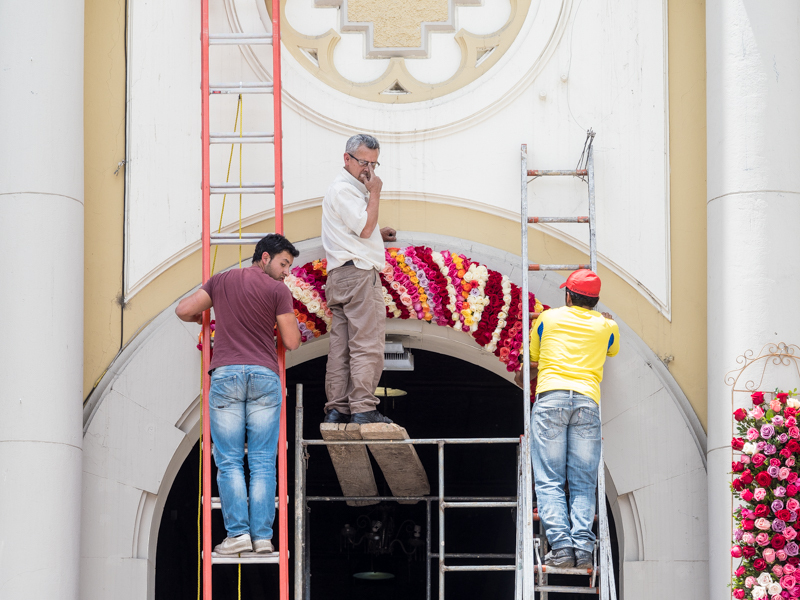 Decorating the church with roses. 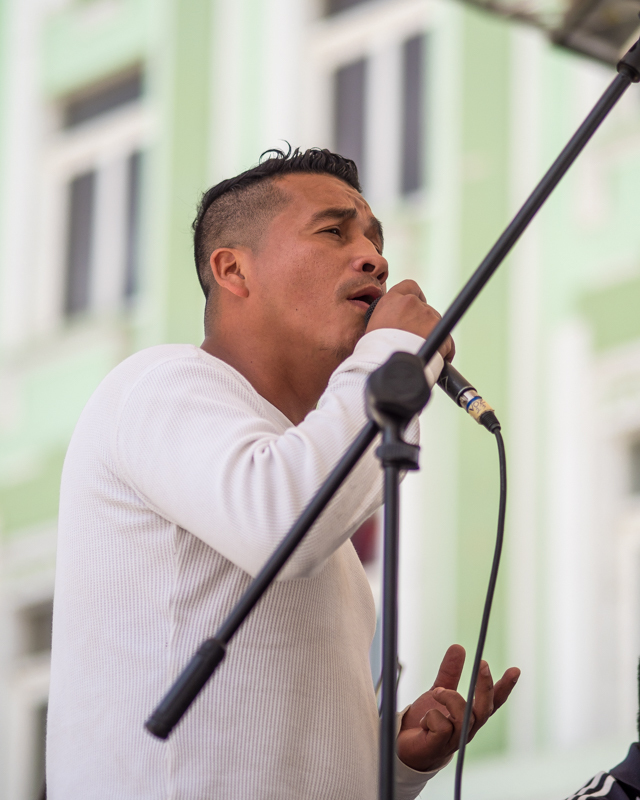 Singer rehearsing for the fiesta concert. So we went back to camper and waited until 7pm. We retraced our steps to the main square and we knew we were in the right spot and time because thousands were making their way there as well. We wiggled our way to the edge of the crowd and could tell from the big screen the processional had turned the corner and was headed our way. The religious fervor was intimidating. But Dave got the photos just as the statute turned the corner where we were standing. After the statute was set into place in an alcove of the cathedral, the orchestra played and priests and town officials read off various proclamations. One set of fireworks went off and then it started to rain. Even though we had our umbrellas, the talking was going on and on. So we decided we had seen enough and walked back to camper. Later we heard many more fireworks. 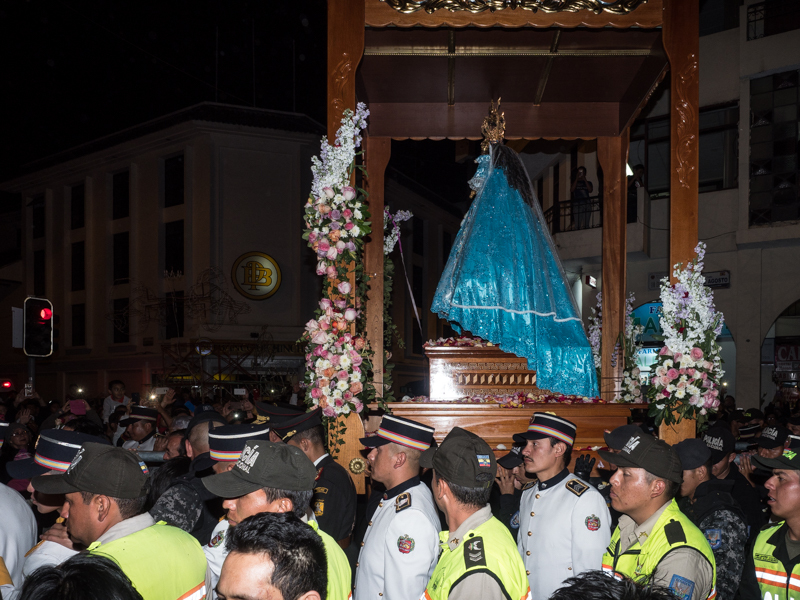 For more details on the Saint, visit: https://sacredsites.com/americas/ecuador/el_cisne.html. 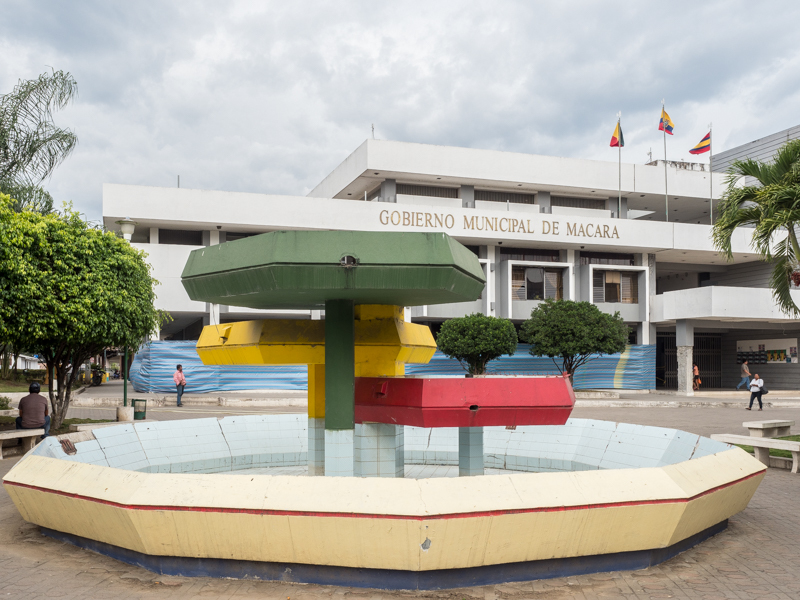 On Monday 21st, we left Loja and drove west to the Macará border town. Interesting scenery – reminded us alot of the US Southwest. Pulled into Macará around 2pm. Stopped and had lunch; filled up with gas since gas in Ecuador is approx $1.50 and close to $4 in Peru, then we boondocked at the edge of a defunct airfield near police station. People were using the airfield as a walking track and a Zumba class was being held on its edge. The next morning we drove to the border with Peru by crossing over the Macará River at 9 am. Cleared out of Ecuadorian Immigration and Customs for the truck in about 15 minutes. Peruvian Immigration took all of 15 minutes; then we ran into a snag. Peruvian Customs’ computer was down. We waited and waited and waited. Approximately 1 hour and half later, their computer system was up and we were able to get the proper entry papers for the truck. Insurance, which is necessary for Peru, once we found the office, took another 15 minutes. The ugliest fountain in South America – if not the world. Our drive from the border first had us going through rice paddies (who would have thought of that?) and then a most desolate dry area. On the road from the border to Priura. 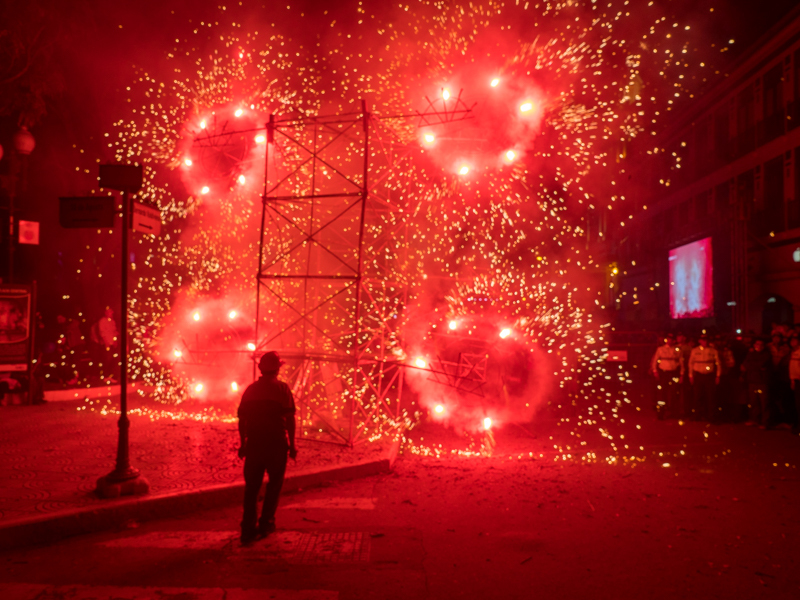 The contrast between Colombia and Ecuador and Peru is stark. We went to Peru and saw Machu Picchu, the Amazon Basin and Lima six years ago and although saw the poverty then, yesterday’s drive into Peru was startling. 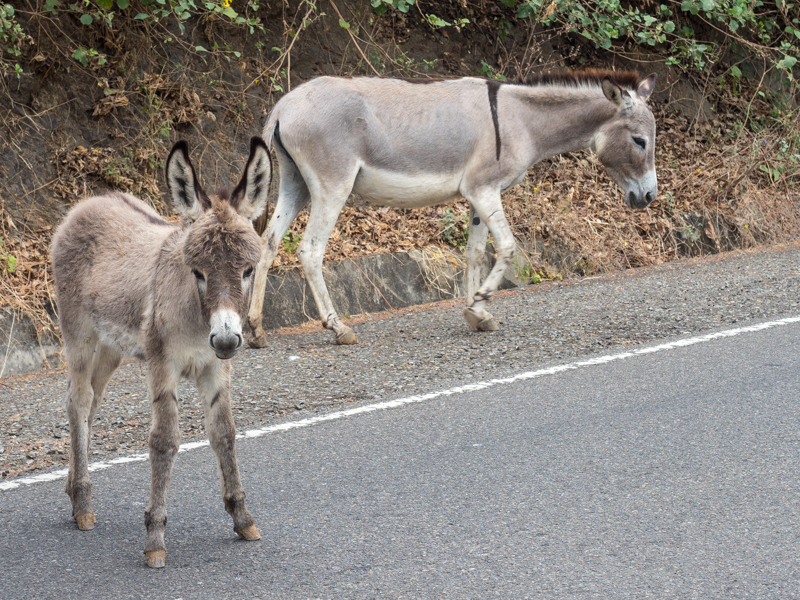 In Colombia and Ecuador, people dress cleanly, houses are well-built even if cinder block, yards and roads are generally kept clean with many new cars on the roads. In Peru that is not the case. Maybe it was the geographical area we drove into and it will be not as poor the further south we get. But houses are little more than stick lean-tos, trash is everywhere and no new cars on the roads. Towns and cities don’t have the multitude of yellow or white taxis on the road; rather there are motorcycle taxis. All three countries have similar governments and are relatively stable. 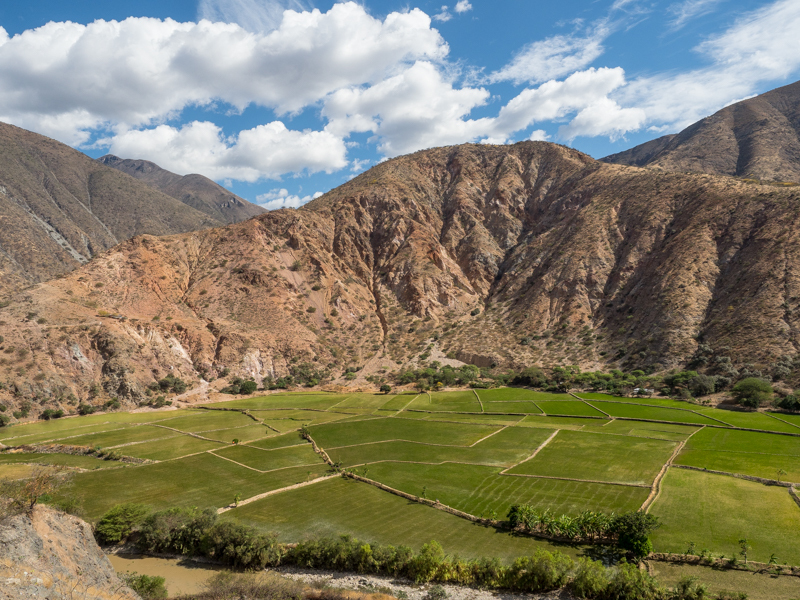 I know this area of Peru was hit hard with massive rainfalls and flooding this past winter which destroyed much of the infrastructure but the landscape speaks of long-term poverty. 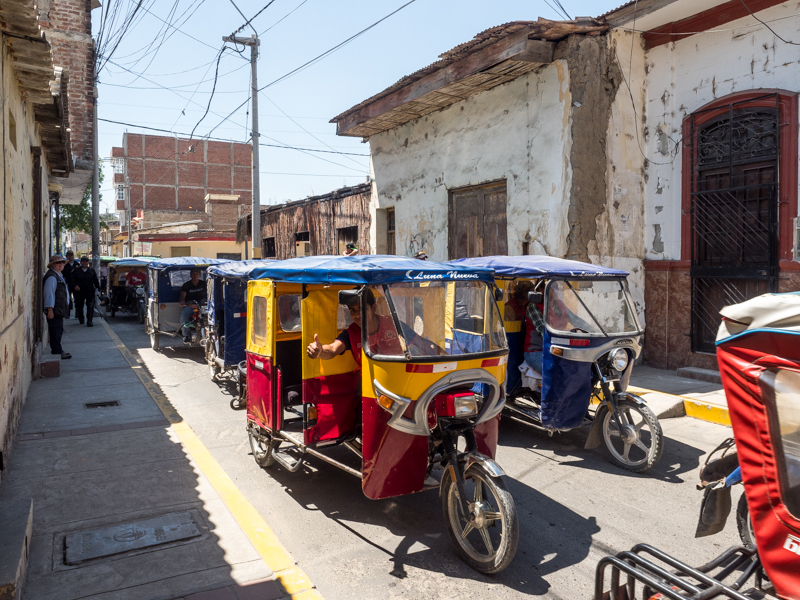 In any case after we reached our destination in Piura after dodging motorcycle taxis everywhere who don’t stick to their lane, we pulled into the El Angolo Piura Hotel. We plopped ourselves into the Hotel’s cool restaurant and partook of the complimentary drink (El Angolito which was a caramel liquor) and had lunch. Our first order of business for the next few days was to get a new Peruvian SIM card and get it activated, get dollars exchanged into Peruvian soles, pull out more soles from ATM at a US-style super mall and find a DHL to send some legal documents back to the US. One day we went into the historical center and checked out several cathedrals and churches and parks in the central area. After having lunch and on our walk back to hotel, we encountered two protests. One outside the Judicial Building and a much, much larger one where hundreds of motorcycle taxis were streaming by. We thankfully left charmless Piura on Friday 25th and after leaving the desolate arid desert, headed back up into the Andes. We decided to push all the way to Jaén on the eastern slope. (Turned out to be one of our longest drives.) Once we left the desert area, the mountain valleys and passes were a welcome site. Although the mountainsides were extremely dry and filled with cactus, the river gorges we traveled through offered green rice paddies one after the other for about 50 miles. On the road from Priura to Jaen. The parking lot in Jaén which was our aim for the night had low roofs so we couldn’t enter. 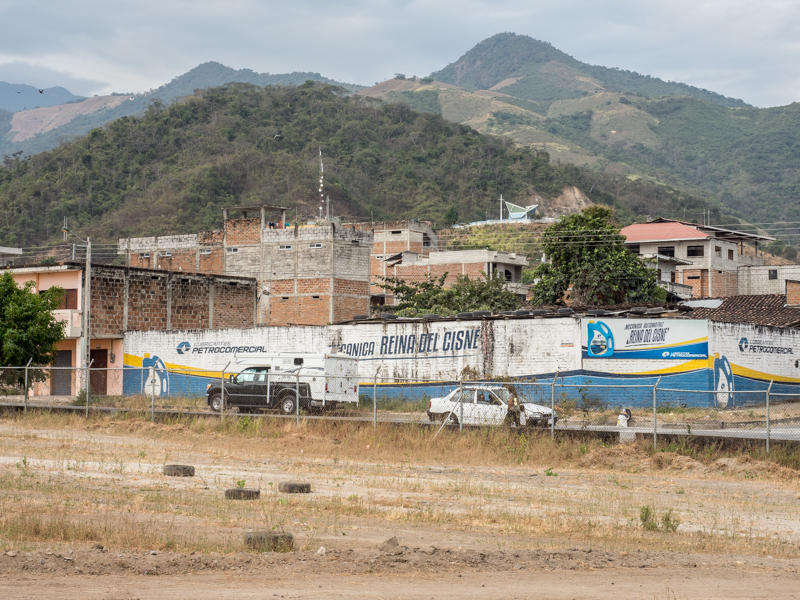 Instead we went around the corner and parked in an upscale neighborhood next to the Amojú River. The next morning a short walk led us to Jaén’s Central Park, an unusual cathedral and breakfast. 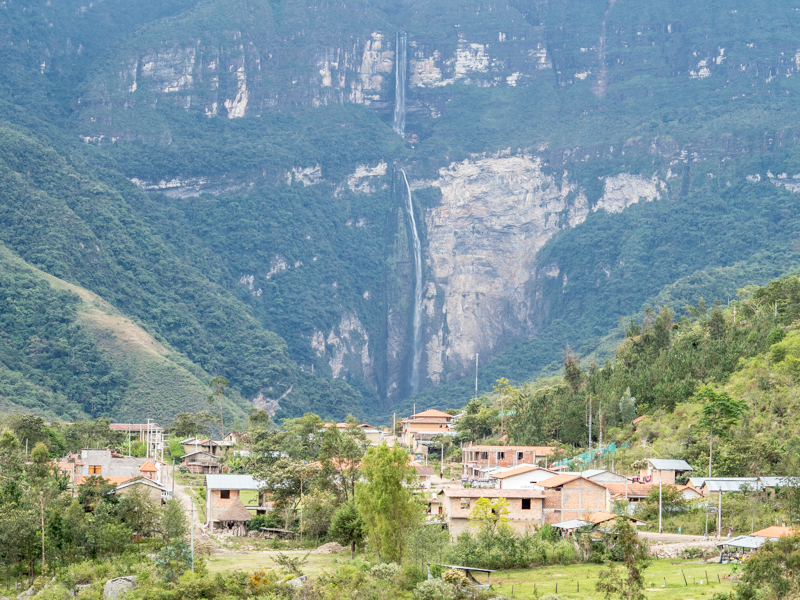 Once we left Jaén, we crossed another river fertile plain and then entered the narrow and scenic river gorges along the Marañon River which is the dividing line between the Amazonas and Cajamarca regions. Our destination was the mountain town of Cocachimba. After driving up 2.5 miles on a dirt road clinging to the cliff edge, we arrived and parked in the gravel parking lot. Our goal was to visit the third longest free-fall waterfall in the world – Gocta Waterfall. We had lunch and decided to tackle the hike the next morning. Best laid plans: Guidebooks and our camping app called this a sleepy quiet town. Well – they were wrong. A large pack of dogs growled and barked outside the camper all night which woke up the roosters who thought 2am was dawn. Dump trucks growled their way up the mountainside and dumped gravel and other building materials until 11 pm. After not much sleep, we started up the trail the next morning but the tourist office was late in opening and we were turned back because we didn’t have a ticket. After going back down and buying our tickets and re-tracing our steps up the hillside steps and dirt path, locals were burning trash and the smoke obscured the view. Disgusted we returned to the camper. Although we originally planned on staying a second night in Cocachimba, we decided to drive on so we could find a quieter spot for the night. 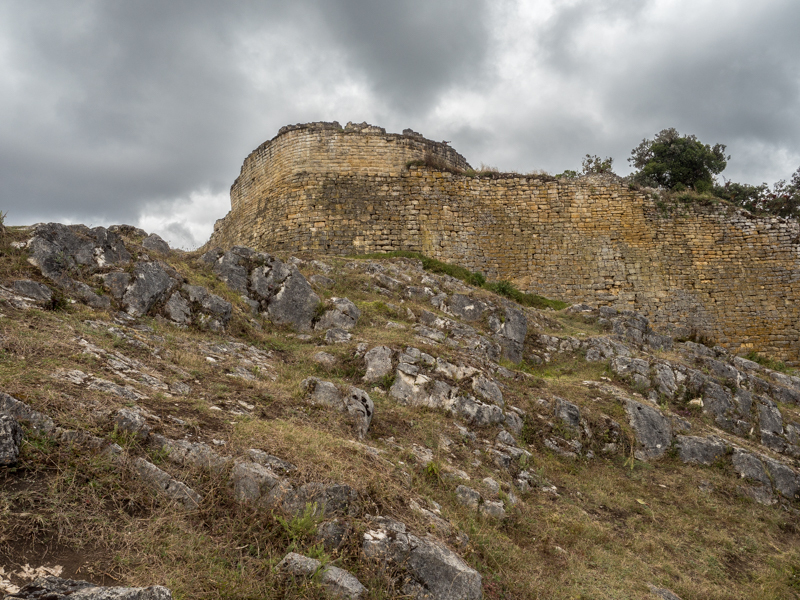 Our next destination was Kuélap – supposedly second in ruins only to Machu Picchu. The tour book and our camping app was outdated. After crossing an extremely steep ravine and climbing 3000′ on the gondola, we discovered we had to buy another ticket for the Archeological site itself. So we did and trudged approximately another 1km up a steep path to the Great Wall. There, unlike the Lonely Planet Guide and website info, we couldn’t actually enter the site – just could walk around the Wall built by a pre-Inca civilization. No signs to inform you of this and no signs even in Spanish, informing us of what we were seeing. (Or in our case, not seeing.) This is a long way off from Machu Picchu which is geared up for tourists. By this point, we were not Happy Campers. We went back down and Dave requested refunds – which they did give us after a phone call to the Boss. Upon our return to Nuevo Tingo we parked and had breakfast/lunch. Where we parked in Nuevo Tingo was not level enough, so we drove down the mountain switchbacks to where the unpaved side road entered the pavement. So we boondocked at that intersection in a gravel pit behind a pile of gravel. Was better than a pack of barking dogs. It was quiet until 12am when a police truck blared their horn at us and woke us up. Dave went out to talk to them and after discovering we were turistas and were just sleeping there for the night, they said ok and didn’t bother us the rest of the night. Will describe our next hair-raising leg in a separate entry. Wow. Peru is radically different from the other South American countries you came through. Glad to hear you are both well.